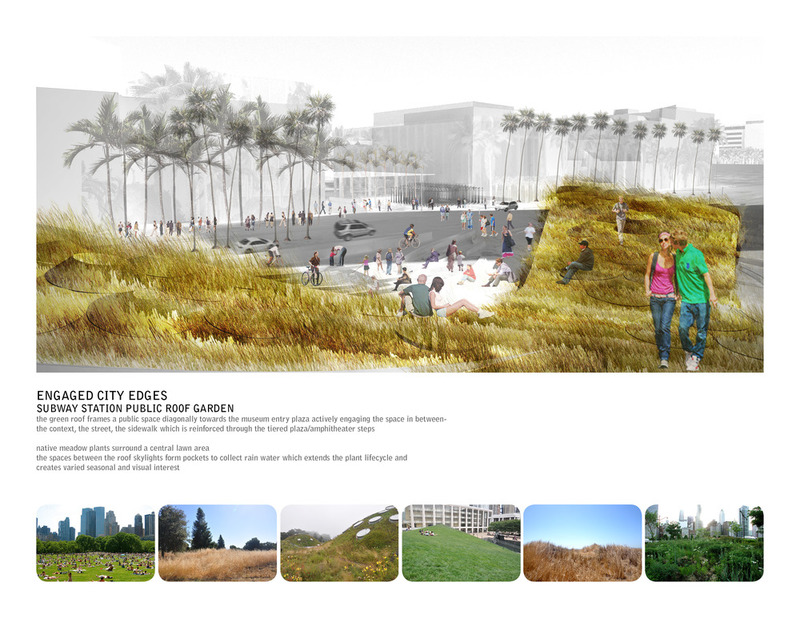 The expansiveness of this landscape challenges the boundaries of the public realm by engaging the various underutilized building fronts, setbacks, and blank walls to create an extroverted public square that engages city edges. The form of the station creates an iconic landscape object that is spatially framed by the surrounding context, expanding it beyond property lines. The centerpiece of the station is the sloped green roof and topographic landform constructed from the reuse of excavated dirt from subway tunneling. The roof landform becomes a high point, a place for observation and reflection, that mediates between the hardscape of the urban street and an intimate softscaped forest. The berm form acts as a sound buffer and barrier from the main boulevard traffic noise; it also gives the landscape elevation for gravity fed irrigation. The center of the roof is a sun lawn surrounded by a native meadow. The surface of the roof landform is dimpled with skylights and a series of undulating mounds that form temporal rain water basins, which create an extended seasonal and visual interest. Rain water not completely absorbed or captured flows down the topographic form irrigating other vegetated areas until it is ultimately collected and filtered in rain gardens at the base. The sides of the landform are made of gabion walls which filter storm water and become terraces for informal gatherings, a series of meandering ramps for a stroll under the expansive canopy of oak trees, or as tiered plaza steps to observe and engage street life. 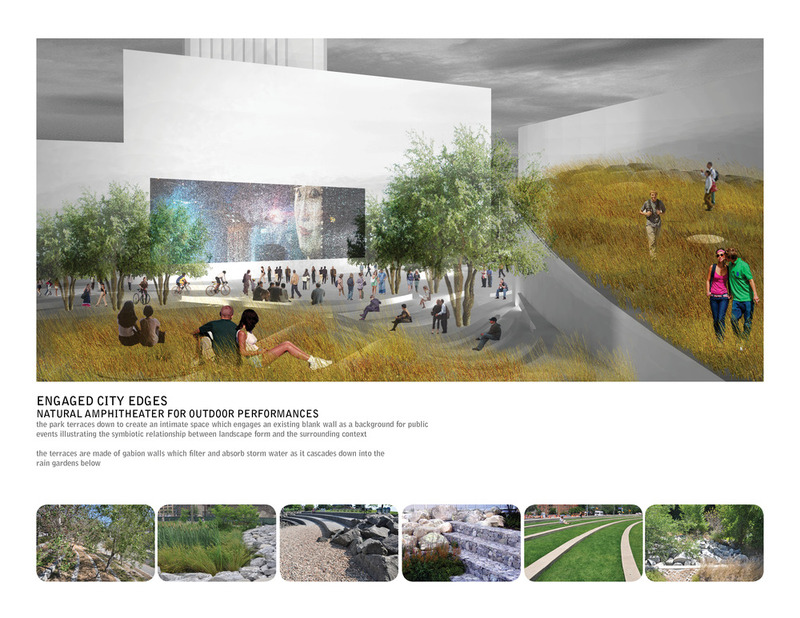 The west side becomes a natural gathering place for public performances by repurposing the blank exterior museum wall and shaded environment as a backdrop for public events. 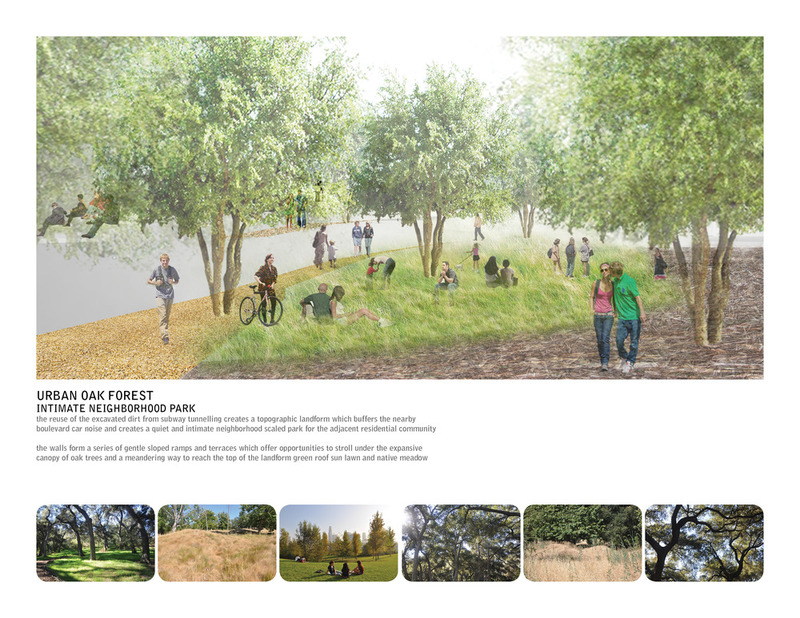 The south side of the landform scales down to an intimate quiet neighborhood urban park forested with oak trees and dappled light, creating an enjoyable shaded place during summer months. The surrounding meandering pavement pattern and placement of seating planters induce happenstance occurrences, which culminate at the tiered plaza steps.